"Is Tom Brady content yet?" In 2005 Tom Brady - at that time the 30-year-old winner of 3 Super Bowls - made some surprising statements to 60 Minutes' Steve Kroft. His three Super Bowl wins came in his first five years in the NFL. That's pretty good. Since 2005, Brady has lost two Super Bowls and won another. That's 4 trips to the top of the mountain! Maybe he's getting bored. 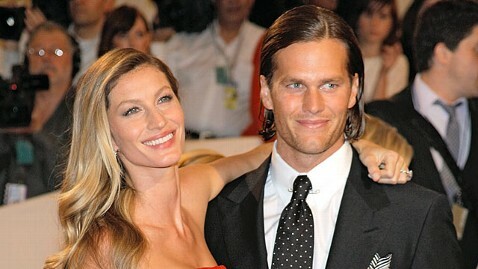 If Tom's still lacking contentment after winning 4 Super Bowls, will winning more rings do the trick? How many will it take - five ... six ... one for each finger? I don't think so. Eating sand will never satisfy a guy who's made to eat steak. And eating more sand will never change this fact (though it may lead to some incredibly clean bowels). Though Brady makes a lot of money, it doesn't seem to be his driving force. He's not even one of the top ten highest paid NFL quarterbacks. He's currently #12, in your program and on the pay scale. Hmmm ... I can't decide whose hair is more magnificent. Tom now has something he didn't have back in '05 - a Brady Bunch. He's married to a rich Brazilian supermodel with a cool German-looking name, Gisele Bündchen (go ahead, say it out loud, it's fun - Ju-zel Boond-chin!). The Bunch also has three kids and an extra mommy of the oldest son. Maybe marriage and kids have answered the question Tom didn't have the answer for in 2005. Obviously marriage and kids can surpass any satisfaction and contentment gained from career accomplishments. But even the depth of satisfaction that can come from having your own bunch can fall short of fulfilling our greatest need. I heard the story of a man who spent his whole life striving to climb to the top of the success ladder. One day, late in his life, he finally made it. "This is what I've always dreamed of," he thought to himself. He looked around with pride in his life-long accomplishment. Then, in an instant, the happy feeling was gone. He barely had time to enjoy it. With a heavy weight in his chest, he looked around and realized that he'd set his ladder against the wrong wall. Crappers. A man can make it to the top of the ladder, even the top of the mountain. But there's something way above these two high points in life. You knew I'd get to it eventually, so here it is: God. Yeah, He's our greatest need, our ultimate goal. What's higher than Him? What else in life is more worthy of our attention and devotion than Him? You see, God knows that He is our ultimate goal, so He diminishes anything else that we would chase after in place of Him. Yeah, He lets us go on these wild-goose chases as we chase success, fame, money, Super Bowl rings and an innumerable array of things. He may even let us chase our whole life. He may allow us to chase and never attain that which we think will satisfy us. But if we do grab it (whatever "it" is), God will ensure that the joy will be short-lived. We've all heard about absentee fathers - the ones who aren't there for their offspring either physically or emotionally or both. Based on the events leading up to this year's Super Bowl, it's clear that Tom has a great relationship with his earthly father. An earthly father's presence in his child's life is essential. When the father's gone, there's a huge void that only the father can fill. But how big of a void exists when your heavenly Father, your Creator, is absent from your life? Is He absent because He left you, or because you've unknowingly (or knowingly) turned your back on Him while you're busy chasing your dreams that don't include Him? Are you an absentee child? Is Tom Brady an absentee child? In fact, we are all absentee children in some way until we come to our heavenly Father. From one man He made all the nations, that they should inhabit the whole earth; and He marked out their appointed times in history and the boundaries of their lands. 27 God did this so that they would seek Him and perhaps reach out for Him and find Him, though He is not far from any one of us. He's so close, and yet so far away if our focus is on other things - even good things - that just can't satisfy and bring contentment like Jesus can. Are you and Tom Brady seeking Him and reaching out for Him? I don't know what Tom Brady knows about Jesus. I don't know if Tom Brady knows Jesus. I don't know if his Brazilian supermodel wife knows Jesus. I know she asks people to pray for Tom to win Super Bowls, so she must think Someone is out there hearing those prayers. But praying to win the big game and knowing God are two different things. I'm no Tom Brady. I can't pull off the magnificent hair thing ... or the 4 Super Bowl thing. But I can match Tom in this - I'm human and so is he (except on the field, there he's a machine!). I've asked the same question Tom Brady asked in the video (but with different words) - "Is this all there is to my life?" I asked this question in my early twenties. Tom waited til he was thirty. Maybe you've asked this question. If you haven't done it yet, you will. You can read my story here. One lesson you can hopefully take away from Tom Brady's experience is this: reaching the mountaintop of a career or some other endeavor will not provide lasting contentment. It may not even provide enough contentment to last to the end of the day that you reach the summit. There are innumerable mountains that we can spend our valuable time climbing in this life. And none of them reach as high as Jesus. But the cool thing is this - you don't need to climb a mountain to get to Jesus. He has to come to you, because you can't get to where He is on your own. Believe in Him and call on His name - He'll show up. Maybe you can learn something from my life. I hope you can learn that true, lasting contentment can only come when you have a relationship with your heavenly Father. Nothing in my life brings me happiness and contentment like my relationship with Jesus and my heavenly Father. And I have an awesome family that makes me as happy as they possibly can. I love them with all my heart. But even they can't take the place of God in my life. And they don't have to. I can have both, just like Tom Brady can have all his Super Bowl rings, his Brady Bunch and Jesus. He just needs to realize that Jesus is #1. But even if you have nothing in life, you can still have Jesus. The mountaintop for these people was knowing the Scriptures. But they didn't realize that the Scriptures they idolized pointed them to Jesus. And they refused to believe in Him and come to Him. So they didn't receive the eonion life only He could give them. They had life, but they didn't have The Life that came by knowing Jesus. The Life is knowing Jesus and and His Father. Tom Brady has a life that is probably envied by millions. But does he have The Life? I don't know. I have The Life, and I wouldn't trade it for anything, not even magnificent hair. P.S. - The story of the prodigal son (or absentee child) is the story of each one of us.